Can Birds and Wind Energy Co-exist? Climate change will have major impacts on birds and their habitats, according to a recent report from the National Audubon Society. Scientists project climate change will drastically alter and shrink habitats in the U.S. for many bird species. These findings add to mounting evidence that natural systems are at serious risk for climate change impacts, which we must act swiftly to mitigate. One solution is to adopt more clean, renewable energy. Utilities have been investing in large-scale wind energy farms at an impressive rate, resulting in 127 million tons of avoided carbon dioxide a year in the U.S. – the equivalent of taking 20 million cars off the road. But a tricky challenge persists in the effort to make our energy system more sustainable overall: large, utility-scale wind energy developments have been known to kill bats and birds and risk fragmenting sensitive habitats. And while wind turbines kill far fewer songbirds than building collisions or cats, raptors and bats are still at risk for turbine collisions. However, we believe clean energy and wildlife conservation do not have to be mutually exclusive. Research on the topic is underway and technology is emerging to help minimize the environmental impacts of wind turbines on birds and bats. Turbine design has advanced from the lattice-tower designs of yesterday to large monopole structures that are less attractive to perching birds of prey. But newer, larger turbine designs still present a danger to soaring raptors and foraging, insectivorous bats. Furthermore, as mono-pole turbines grow larger with bigger rotor-swept areas, we need to seek ways to minimize risk to vulnerable migratory species like Whooping Cranes. This calls for guiding turbine siting away from sensitive habitats and important migratory flight paths and more toward disturbed lands. Scientists, conservation organizations, and industry leaders are currently pursuing a variety of technological solutions, such as distributed energy and energy efficiency improvements, smart siting, experimental turbine designs, and wildlife mapping, monitoring, and detection technology to reduce wildlife risks. Monitoring technology: Some facilities now use “bio-monitors,” which are basically people monitoring the skies with binoculars for approaching eagles and California condors, in conjunction with radar. Bio-monitors can alert operators to curtail turbine arrays as raptors approach. In other cases, radio scanners are employed to detect transmitter tags on condors in order to curtail turbine operations as they approach. According to Dr. Allison, there is great interest within the wind industry and conservation communities in developing detection technology, but right now the best solution appears to be a combination of radar detection and human monitors. On other fronts, Cornell Laboratory of Ornithology’s BirdCast project uses radar to produce detailed bird migration forecasts that could be useful to inform wind energy operators about bird migration patterns in real time, allowing them to adjust turbine operations. Smart curtailment: Curtailment of wind turbines has shown to be the most effective approach to reducing bat kills, and “smart curtailment” is being pilot-tested in some places as a way to selectively shut down turbines when bats are present. Patterns of bat kills have been linked to environmental variables such as wind speed, humidity, and passage of weather fronts. Smart curtailment involves a central command center that can send messages to individual turbines to shut down when conditions arise that could contribute to bat fatalities. Curtailment isn’t necessarily aligned with manufacturers’ specifications for turbine operation, however, and may have real or perceived impacts on energy reliability, so there’s still a pressing need to optimize operations in a way that balances wildlife fatalities with energy production. Deterrence: Deterrence technologies that broadcast ultrasonic noise, which discourages bats from foraging around turbines, can also be effective, but this new technology is still daunting and not as effective as curtailment. Turbine design: Exploratory research into new turbine designs also shows promise. Aerodynamics research at Caltech is exploring how smaller, vertical-axis turbines can be arranged to take advantage of air drafts. This technology is patterned on fluid dynamics observed in schooling fish, with potential for maximizing local energy production while reducing a wind farm’s overall footprint on the landscape. Smaller, local wind facilities using lower-impact turbine designs also have the potential to reduce peak energy on the electric grid, resulting in less demand for utility-scale energy development. Mapping and smart siting: Conservation scientists and the wind industry have been mapping wind and wildlife resources in an effort to optimize siting of wind facilities in places with high wind production but relatively lower biodiversity impacts. This week, a research meeting is being held by the National Wind Coordinating Collaborative in Colorado to discuss wind energy and wildlife interactions. Also, the Department of Energy is showing interest in innovative technological solutions to reduce wildlife impacts of wind energy, and EDF recently signed on to a letter addressed to Energy Secretary Moniz, along with wildlife conservation groups and wind industry representatives, requesting that research funds be directed to this effort. By and large, most known bird and bat fatalities attributed to wind energy occur at wind farms where large turbines are concentrated. Part of the solution is distributed energy generation, like smaller on-site wind turbines and rooftop solar that produce power where it’s consumed. Distributed energy generation is more efficient, affordable, and reliable than off-site, utility-scale power generation. By producing renewable energy right where it’s consumed, we’re matching energy demand with supply locally and sustainably, thereby shrinking our energy footprint on the land and in the skies. The EDF Clean Energy Program is working to reform the regulatory system and transform our country’s outmoded electric grid to clear the way for more distributed energy options. 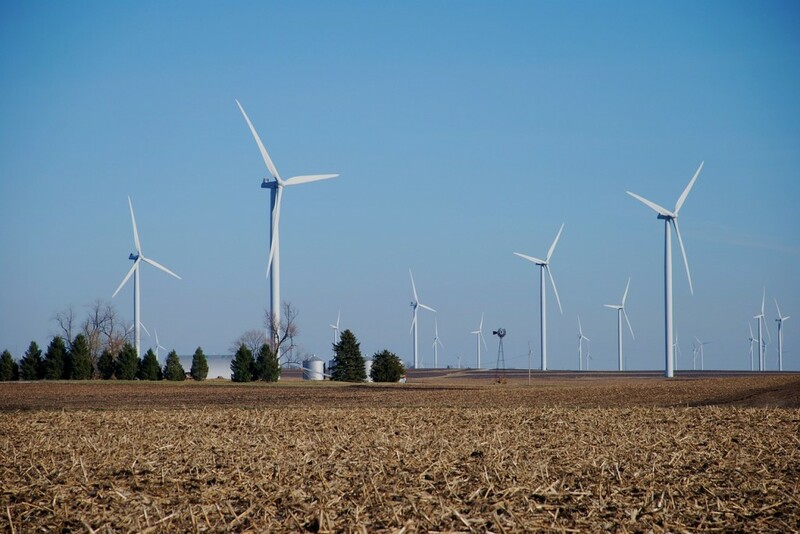 Another obvious way to reduce the impact of utility-scale wind farms on birds and bats is by reducing our total demand for energy through conservation. It has been estimated that by 2020, the United States could reduce its annual energy consumption by 23 percent through energy efficiency measures, offsetting the need for additional energy infrastructure build-out. This could cut greenhouse gas emissions by over a gigaton – the equivalent of taking the entire U.S. fleet of passenger vehicles and light trucks off the roads – and reduce peak demand on the electric grid. Given the ultimate importance of renewable energy to mitigate climate change, there is an urgent need to find practical and affordable solutions to wind energy impacts on birds, bats, and their habitats so that renewable energy becomes fully sustainable. We believe it can and must be done. This entry was posted in Clean Energy, Climate, Energy Efficiency, Renewable Energy. Bookmark the permalink. Both comments and trackbacks are currently closed. “By and large, most known bird and bat fatalities attributed to wind energy occur at wind farms where large turbines are concentrated.” These are also the places where it’s easier to monitor fatalities. Is there any sound evidence to suggest that distributed generation would kill fewer birds and bats per MWh? Thank you for your question, Ben. We are not aware of any studies specifically designed to evaluate relative wildlife impacts of distributed energy vs. utility scale renewable energy at this point, but we would certainly encourage that line of research when there is enough distributed energy on the ground to study this question at a meaningful scale. As you point out, there could be study design challenges of evaluating distributed energy impacts, but such a study could incorporate citizen scientists in order to cover a lot of ground. In the meantime, there are a few lines of reasoning and research that we believe do support distributed energy as part of our proposed solution. First, a recent analysis of compiled studies indicates that mortality risk to birds increases with turbine height. Also, when we talk about distributed energy, it represents a mixed portfolio, including but not limited to: rooftop and small-scale solar, small wind turbines, combined heat and power (CHP), and waste-to-energy. Given that distributed energy is produced where it is consumed, it requires far fewer miles of transmission lines that contribute to avian collisions and habitat fragmentation. As distributed energy is, by definition, produced on site, or at least very near where it is consumed and often in previously developed areas, it tends to occupy a much smaller land use footprint. This means far fewer potential interactions with vulnerable bird species and tree-roosting bats in their habitats and less habitat disturbance overall.